The American city of Baltimore is famous today as the setting for the gritty crime-drama The Wire. But it has an older claim to fame: it was where one of the America’s greatest writers lived in his youth and finally returned to die after years of poverty, illness and hard drinking. That was in 1849, when Edgar Allan Poe came to the end of his brief but productive life. It produced a lot of misery for him and a lot of pleasure for his readers. Those readers have never gone away, because Poe is one of the undisputed giants of American literature, influential not just on hundreds of other writers but on American culture in general. He was born in 1809 in Boston to two poor actors, David and Elizabeth Poe. But his father abandoned the family and his mother died when he was two. He was adopted into the family of John Allan, a rich tobacco merchant from Virginia. The seeds of his later troubles were undoubtedly sown in those early years, but they must have fallen on fertile ground. After a move to England from 1815 to 1820, then an unsuccessful year at the University of England, Poe enlisted in the US Army. In 1830 he entered the famous West Point Military Academy, where officers were trained for a life of service to the nation. But the discipline and rigidity of the academy weren’t for Poe: he was thrown out the following year and left the army to begin the writing he already set his heart on: that of poet and author. At first it seemed to go well. His story “MS. [Manuscript] Found in a Bottle” won a newspaper competition, but its dark themes of mystery and oblivion were a forewarning of the troubles to come for its author. Like the narrator of the story, Poe seemed trapped by history, rushed along against his will towards his doom. He married a beautiful young wife and lost her after a long illness; he won good jobs and was sacked or resigned; he struggled with drink and his own ill-health. His early dreams of wealth and literary fame were never truly realized, but perhaps without his own suffering he would never have written such convincing stories of death and horror or charged his poetry with such emotional and symbolic power. 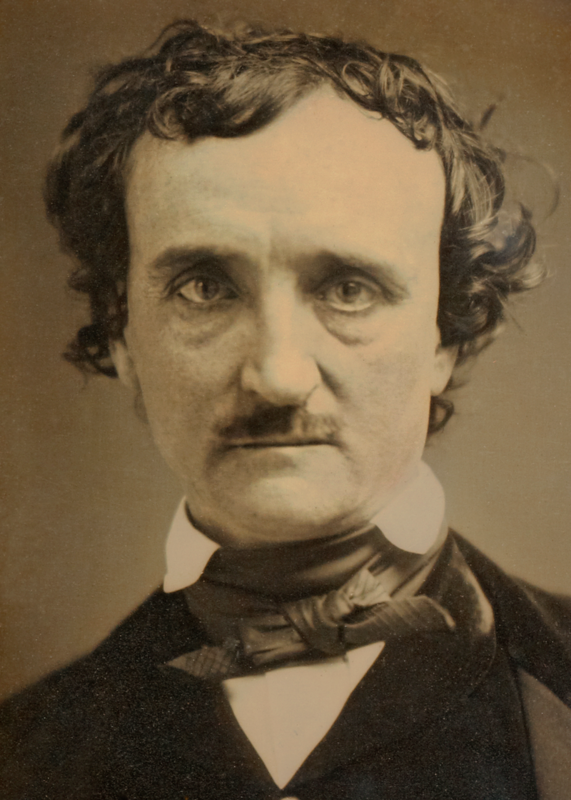 During his years of struggle, he was writing poems like “The Raven” and stories like “The Masque of the Red Death”, “The Pit and the Pendulum”, “The Black Cat”, “The Tell-Tale Heart”, “The Murders in the Rue Morgue”, “The Premature Burial” and “The Cask of Amontillado”. Death and doom were constant themes of his work and in the last two stories he faced one of his own greatest fears: that of being buried alive after a mistaken medical diagnosis. At their best, his stories are like thunder-storms, full of darkness that is suddenly split by lightning and thunder. You can read them once and remember them for life. But many fans of Poe read his stories again and again, never wearying of the demons he conjures and dark emotions he evokes. His huge intelligence and inventiveness are an essential part of his appeal. His stories about the French police-agent Auguste Dupin began the detective genre, becoming core influences on Sherlock Holmes and a thousand other crime-fighting heroes. What might Poe have achieved had he lived longer? Perhaps much less: he died young because he lived hard. Without that hard life he might poured less passion into his poems and stories. He would certainly have had less experience of dark emotions and sorrows. And perhaps he always knew that he was writing against time. It’s easy to believe that when you open one of his books and allow the thunderstorm of his imagination to burst inside your head.